The German Pope Damasus II died in 1048, and the Romans sent to ask Henry III, Conrad's successor, to let them have as the new pope either Halinard, Archbishop of Lyons, or Bruno. 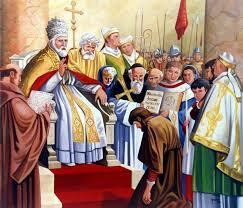 Both of them were favourably known to the Romans by what they had seen of them when they came to Rome on pilgrimage. Henry at once fixed upon Bruno, who did all he could to avoid the honour which his sovereign wished to impose upon him. When at length he was overcome by the combined importunities of the emperor, the Germans, and the Romans, he agreed to go to Rome, and to accept the papacy if freely elected thereto by the Roman people. He wished, at least, to rescue the See of Peter from its servitude to the German emperors. When, in company with Hildebrand he reached Rome, and presented himself to its people clad in pilgrim's guise and barefooted, but still tall, and fair to look upon, they cried out with one voice that him and no other would they have as pope. Assuming the name of Leo, he was solemnly enthroned 12 February, 1049. Before Leo could do anything in the matter of the reform of the Church on which his heart was set, he had first to put down another attempt on the part of the ex-Pope Benedict IX to seize the papal throne. He had then to attent to money matters, as the papal finances were in a deplorable condition. To better them he put them in the hands of Hildebrand, a man capable of improving anything. In January, 1050, Leo returned to Rome, only to leave it again almost immediately for Southern Italy, whither the sufferings of its people called him. They were being heavily oppressed by the Normans. To the expostulations of Leo the wily Normans replied with promises, and when the pope, after holding a council at Spoleto, returned to Rome, they continued their oppressions as before. At the usual paschal synod which Leo was in the habit of holding at Rome, the heresy of Berengarius of Tours was condemned&#mdash;a condemnation repeated by the pope a few months later at Vercelli. Before the year 1050 had come to a close, Leo had begun his second transalpine journey. He went first to Toul, in order solemnly to translate the relics of Gerard, bishop of that city, whom he had just canonized, and then to Germany to interview the Emperor Henry the Black. One of the results of this meeting was that Hunfrid, Archbishop of Ravenna, was compelled by the emperor to cease acting as though he were the independent ruler of Ravenna and its district, and to submit to the pope. Returning to Rome, Leo held another of his paschal synods in April, 1051, and in July went to take possession of Benevento. Harassed by their enemies, the Beneventans concluded that their only hope of peace was to submit themselves to the authority of the pope. This they did, and received Leo into their city with the greatest honour. While in this vicinity, Leo again made further efforts to lessen the excesses of the Normans, but they were crippled by the native Lombards, who with as much folly as wickedness massacred a number of the Normans in Apulia. Realizing that nothing could then be done with the irate Norman survivors, Leo retraced his steps to Rome (1051).